“Skip should have won,” one person said. “He was just TOO smooth,” another said, “He made it look TOO easy.” “North County judges,” a third San Diegan added. Their boards already loaded, each of them, two guys, one girl, dressed in 1965’s appropriate après surf uniform of Levis, t shirt, windbreaker; they looked at me long enough for me to realize I was part of the North County surfing audience intended to hear the criticism. Really? No, I was a chunky just-turned-fourteen year old kook walking from the far end of Tamarack’s lower parking lot carrying my ridiculous, used, already-an-antique Velzy/Jacobs balsa wood board, wearing some sort of unfashionable and stretchy trunks that were, in reality, a compromise between the Hawaiian print jams I wanted and the Australian bunhuggers (like my Dad wore) that my mom had purchased for my trips to the beach two years earlier. Sure, I’d have preferred to be carrying a newer board, wearing Kanvas by Katins trunks; those had surf integrity; or the colorful striped nylon trunks featured in “Surfer.” Jantzen, maybe. Nope. Later, after appropriate whining, I’d get some jams. After catching several times on my knees, they ripped out. Still, to shrug off a near-win/loss was stylish. Though he was featured in many a classic Ron Stoner photograph, arching or crouching in the tube at The Ranch, sliding across crystal waves at Blacks, and scored well for years in the annual “Surfer Poll,” Skip Frye wasn’t a flashy sprinter. He was in it for the long run; super marathon; steadily, consistently sliding. Skip Frye has been quietly ruling the waves between Pacific Beach Point and Crystal Pier, and, of course, beyond, for what is forever in the lives of most surfers. Already well known in the mid-sixties, he continues to surf with style somewhere beyond his mid sixties. I’ve written about Mr. Frye before, how I, probably in my lucky Hang Ten trunks, walked past him at Tourmaline Canyon in the early seventies. I was carrying my brand new, pirated version of the Waterskate he had been working on for Gordon and Smith in conjunction with Tom Morey. Information, insight, some connection to the craft. In a crowded Saturday morning lineup north of Crystal Pier in the early seventies, all of us scrapping on our short boards, Skip, on some almost-a-joke-at-the-time longboard, would paddle laterally, then ease toward shore, picking up some unseen wave-between-waves, stand, ease into a perfect little peak. And, this many years after that, he still is. Check the previous piece for apologies and disclaimers. Far from the twisted reach… of crazy sorrow. 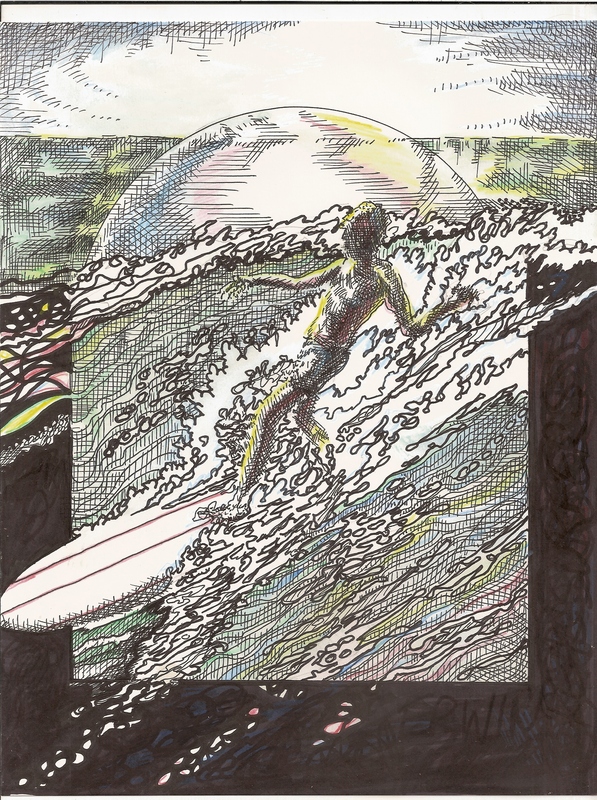 This drawing was taken from one of a series of photos taken by Harold Gee in 1965 at Pacific Beach Point. At about the same time, Dylan’s song, “Mr. Tambourine Man,” had already been covered by popular performers of the time. The thing is, both artists are still going. Somehow illustrations have become a bigger part of my site than I originally planned. This is fine, even great with me. Classic Ron Stoner photos of Skip at The Ranch are part of my image-centric memory. Maybe yours, too. I started drawing one… wasn’t happy with it; Skip in the slot, hands at his side, arching slightly. And the lighting was perfect. And, at the same time, I wanted to say something about other local PB surfers from my years (1971-’74) there. I couldn’t think of this guy’s name. Then I did. Dale Dobson. I googled the name, got a video of a longboarder at Swamis. Wait, wasn’t Dobson a goofy-footer? I checked farther, found a photo of Dobson at Big Rock, 1965. Yeah; goofy-footer. Then, in this group of photos by Harold Gee, there was this shot of Skip Frye at… he might have called it PB Cove, which I’d have to guess is somewhere between the Point and Tourmaline Canyon. And the photo looked so familiar. It may have been used in Gordon and Smith Surfboard ads from the time. Anyway, this is the black and white version. I just purchased some watercolor pencils, and, now that this version is on the computer, watch out! Meanwhile, if Dylan or Gee, or even Skip Frye, have a problem with me using images or words… maybe their people can contact… wait, I have no people. So, hey, check back later. Thanks for dropping in. realsurfers is not intended to be a secret spot. NOTE: I tried to scan the drawing in black and white; didn’t work. The black would have been… sorry you can see a drawing is really just a bunch of lines. Those who don’t know the power of any wave talk of wave size. A wave is unseen energy made visible. “Made manifest” some would say. Oh, waves will usually push you toward land. Yet we love the power. Grind, thresh, thrash, trash. we heave ourselves off, out, into. This is a photo of my friend, Archie, known along the Straits for his classic longboarding skills, his polite demeanor, his classic rides (as in vehicles- this being one of several). This is a typical day on the Straits of Juan de Fuca, so, if you’ve heard there are sometimes waves, sometimes great waves there, no; rumor; don’t bother. In many ways Archie is a throwback to a time when surfing was about the flow, the style; any aggression aimed at the waves rather than other surfers. Archie learned to surf in his native Japan, and, though riding a nine foot plus board was out of fashion when he started, he never wanted to be a short boarder. Archie, now long-but-selectively Americanized, is an expert on salmon production, specifically salmon eggs, and has been all over the world, always near a coast; usually spending the summer in Alaska, working long, long hours. This gives him some freedom, when home, to look for waves along the points and rivermouths of the Olympic Peninsula. He owns a classic Dewey Weber Performer and another ten foot board. That would be the one I ran over on our last session. Having been skunked the previous two trips (see, skunked? ), we were delighted to find rideable waves, and, even rarer, some rights. Paddling out, I watched Archie catch the first one… knee paddle takeoff, drop, turn, glide. In my usual over-amped mode (knowing the waves could just stop coming), three waves later, a little too far up the reef, I thought for a second about going left, then right, then… there was Archie, evidently confident that I had some control. Nope, already dropping, I ran straight over his board as he bailed. I heard a solid ‘thump,’ figured I’d ended my session with a broken fin. Nope; but I did put a four inch cut into the nose of Archie’s board. Luckily, on this occasion, he was riding with me. Otherwise, and it might have been fitting and just, I’d have been be hitchhiking home. Nope. Archie chuckled about it; told me how he’d fix it. “Sort of a memento,” I offered. Drop In! We can all enjoy the ride together. Nice sentiment; not that I mean it; not in the water. I am trying to get over my wave greed; not trying that hard. Oh, maybe if it’s a really long wave and you give me room. Maybe if we can laugh about it later, on the beach. maybe then I make my move. We all have the same obsession; different levels of passion. Maybe. Drop in and see. I’m not sure what happens when I try to capture an image. Sometimes I lose control. Am I ever just totally satisfied with the results? No. In this instance, I saw a photo of Dane Reynolds in a magazine; Dane defying gravity, blowing out of a powerful left, not putting his board on rail, but using the fins as a hinge, swinging back into the very power he’d just escaped. But, I couldn’t find the photo again. Was it really there, somewhere, a little farther down in the stack? So, this is the result, third or fourth attempt. Could be better. A little too much this, not enough that. We keep trying. So much of surfing is really, in our imaginations, memories not quite like the hard copy. When I find the original photo… we’ll see.